Feel like you have escaped to the country side every time you come home! This cottage style cape cod home features four bedrooms, three bathrooms, a desirable open floor plan with vaulted ceilings, and cozy nooks and loft areas that add extra character and charm to this home. Enter through the mudroom with a three-quarter guest bath and right into the light-filled western-facing great room. The kitchen offers cherry cabinetry, curved breakfast bar, walk-in pantry, wood stove and lovely flow to the main living and dining areas with access to the screened porch featuring a Panton stone wood-burning fireplace. The executive-style office/den with natural cherry woodwork rounds out this floor – offering a private space on the main level and one of two Rumsford fireplaces! The second floor features 3 bedrooms, including a master suite with attached bath and a balcony with western exposure. There is even a third floor with additional spaces if one is looking for some indoor peace and quiet. A finished room in the basement is also a nice added touch for extended living space, a workout room, etc. Perfectly situated on a private 20+ acres, take in the Adirondack and Lake Champlain views as well as the beauty of the gardens throughout, open lawn, and wooded trails. Each and every night, the day will end with the glow of the sunset – from the many spaces in the home, the deck off the screened-in porch, simply sitting in your yard, or from the ridge which is an easy hike away! 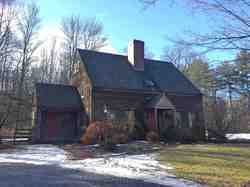 I have a question about the property at 205 Ridgeline Road Panton VT 05491 (#X18372221). I would like to schedule a visit for the property at 205 Ridgeline Road Panton VT 05491 (#X18372221).